Blue Birds... Wishing for Spring? 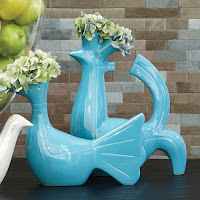 So is it just me, or are these blue bird vases totally adorable? Me and a co-worker/fellow designer were surfing yesterday for new accessories to order for the shop, and we came across these from Global Views. Maybe it's the fact that they come in a color close to robin's egg blue, which is my current favorite, or maybe it's just the fact that they're quirky and happy and remind me of spring, but I just love them and could easily find a happy little home for them in my own house. Speaking of spring, come on, already! Right? I think snow's as pretty as the next person, but I'm sick of the winter wonderland stuff. I want warmth and sunshine! On a consistent basis! I hate to wish time away - goodness knows it passes by fast enough on its own. But every winter, probably around this point of winter, actually, I find myself yearning for spring. So blue bird accessories are calling out to me. If you read this, let me know what you think. Love 'em or hate 'em or somewhere in between?